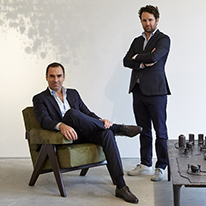 Founded in London in 2006 by Julien Lombrail and Loïc Le Gaillard, Carpenters Workshop Gallery produces and exhibits functional sculptures by artists and designers going beyond their traditional fields of expression. The mission entrusted to Communic’Art since 2014 is to go beyond the frontiers between Art and Design, and position the gallery as a pioneer in France and abroad. Working on specific messaging and a precise definition of the gallery’s objectives, Communic’Art designed a strategy placing CWG at the heart of the emerging market we call Collectible Design. For the gallery’s 10th anniversary in 2016, Communic’Art ensured media coverage for the opening of the 8,000 m2 workshop in Roissy, dedicated to research and development, a sign of the gallery’s support for the creation of major works. Communic’Art’s expertise in crisis communication, such as during the installation of the monumental Domestikator sculpture, which was rejected by the Louvre and installed on the forecourt of the Pompidou Centre for the FIAC 2017, was a major milstone in our mission for the gallery. Thanks to unprecedented media coverage in terms of quantity and quality, and a carefully constructed editorial and digital line, Carpenters Workshop Gallery is today known worldwide as the reference point for Collectible design. Our communications operations around major events such as the opening of new galleries in New York (2015) and in London (2016), the Studio Job retrospective at the New York MAD House (2016), the opening of the Roissy Workshop with 8,000 VIPs (2016), the Robert Stadler exhibition at the Noguchi Museum in New York (2017), the Maarten Baas exhibition at the Groninger Museum in the Netherlands (2017), and the installation of the Domestikator on the forecourt of the Pompidou Centre in October 2017 increased the gallery’s visibility through spectacular events, affirming its position as an innovative gallery in the field of contemporary art.